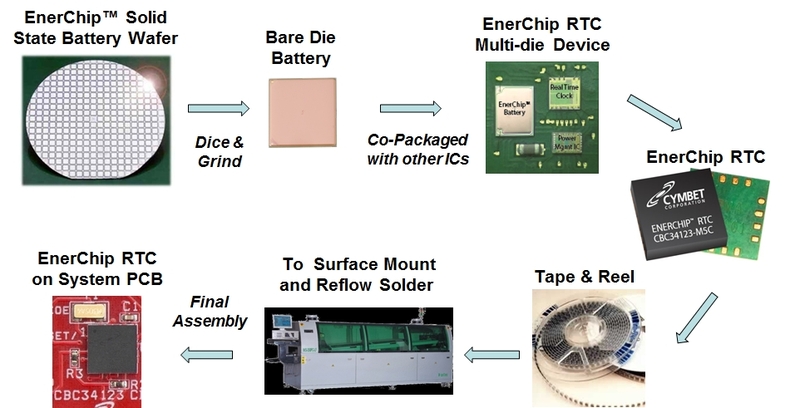 Since EnerChip devices are produced like semiconductor devices, they are packaged in the same fashion as other ICs. EnerChip bare die lead attachment may be accomplished with either wire bond attachment as shown in the following examples. 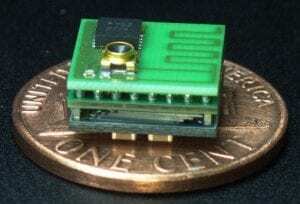 Given the unique structure of EnerChip devices, there are several ways to mount and attach the EnerChip bare die. The traditional method of wire bonding is what Cymbet utilizes in standard EnerChip packaged offerings as it is very reliable and cost effective. Wire bond techniques are shown in the following diagams in three configurations: Side by Side as shown in the EnerChip RTC product family, , Stacked Die in a “Wedding Cake” configuration or Stacked Die in a “Waterfall” configuration. EnerChip bare die may be processed with gold solder bumps on the attach pads. 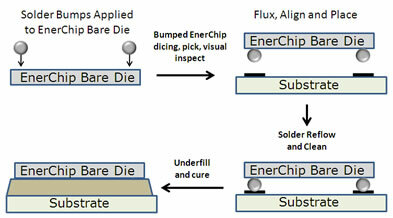 Bumped EnerChip bare die can then be attached in the package as shown in the following diagram. Contact Cymbet Applications Engineering for details.